Chris Kwok is a lawyer. Shirley N. Lew is a journalist. Last year the case of Peter Liang brought together the Chinese community to support a police officer on trial for the wrongful death of an unarmed black man in a Brooklyn Housing project. The case happened after a series of killings of unarmed black men by police in which police officers lost their jobs but were found "not guilty" by the court. In a podcast interview Chris Kwok and Shirley N. Lew share their thoughts about Peter Liang. Chris Kwok is a lawyer and Shirley N. Lew is a journalist. Each brings their own unique perspective to this landmark case. Podcasts made by Chinatown Talk Radio in collaboration with Pucho Web Solutions. In the aftermath of the conviction, a "Friendship tour" was organized to bring together the Asian and Black communities in New York. A group of 16 people traveled to China in order to build lines of communication and understanding. The tour group consisted of Toisanese from Manhattan Chinatown and Hakka Chinese. In total 16 people participated in the Friendship tour. Sixteen people went to China, many were racially mixed Chinese. With no agenda to discuss, the sole purpose of the "Friendship tour" was to develop relationships and friendships. So if conflicts occur, as with the killing of Akai Gurley, at least there was a communication channel among us. While in China, we visited a Toisan to find long lost relatives. The other Toisanese members of my group were able to find their relatives in China, but I had no such luck. Later in the trip we re-grouped with the Hakka people on the tour in Shenzhen to visit a Hakka village and learn more about Hakka history and culture at a museum. There were more Toishanese than Hakka people of this "Friendship tour." The relationships continue as the new friends are helping each other to produce the New York Hakka Conference this weekend. In fact, Toisanese are presenting workshops at New York Hakka Conference. Havana Chinese Cemetery Project. Most Chinese Cubans are from Toishan since no Chinese migrants to Cuba were of Hakka descent. Photos by Jook Leung. TALES OF THE GOLDEN SPIKE: Did the Hakkas join the Punti? By Corky Lee and Bayer Lee. Hakka Cuisine presented by Don Lee. 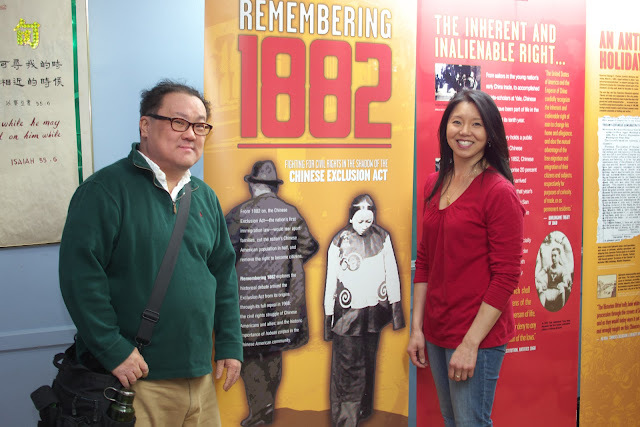 Chinatowns And Chinese Associations In The Americas with photos from Corky Lee and Jook Leung. So even though it is a Hakka Conference, there is a major Toisanese presence. Although we agree to disagree on many things, at least there is an ongoing dialogue in our communities. New York Hakka Conference activities start tonight at 6:30 PM at Flushing Town Hall and continue until Sunday night.